Cinematographer Larry Fong was one of 176 invited to join the ranks of the Academy of Motion Picture Arts and Sciences, home of the Oscars. Others include Best Supporting Actress winner Octavia Spencer, Best Documentary Short winner Daniel Junge, graphic designer Kyle Cooper, actor Matthew McConaughey, design Scott Chambliss, makeup designer Amanda Knight, Best Director winner Michel Hazanavicius, actress Melissa McCarthy, cinematographer Larry Fong and Best Film Editing winner Kirk Baxter. It was a surprising Friday for Larry Fong last week. The “Super 8” cinematographer was one of 176 people invited to join the Academy of Motion Picture Arts and Sciences. Fong didn’t know, however, until The Gold Knight congratulated him on Twitter. Well, congrats, Larry. It’s well deserved. (“Super 8” was this editor’s favorite film of 2011). @goldknightblog The furthest thing from my mind. Was not seeking it out at all. Among the other invitees are “artists and executives who have distinguished themselves by their contributions to theatrical motion pictures,” according to the Academy, which sends out invitations only once per year. Last year, 178 were invited to join. Voting membership in the organization has remained at just under 6,000 members since 2003. Among the invitees are (pictured above) 2011 Best Supporting Actress winner Octavia Spencer, Best Documentary Short winner Daniel Junge, graphic designer Kyle Cooper, actor Matthew McConaughey, production designer Scott Chambliss, makeup designer Amanda Knight, Best Director winner Michel Hazanavicius, actress Melissa McCarthy, cinematographer Larry Fong and Best Film Editing winner Kirk Baxter. Other Oscar winners and Oscar nominees from this year were also invited to join. Also invited are Fritz Gabriel Bauer, Lee S. Berger, Ronald Bernstein, Ariel Emanuel, Jean-Marie Lavalou, Bryan Lourd, Dale Oliver, Jeremy Plager, John B. Quinn and Steve Weinstein to Associate membership, which does not include the ability to vote for Academy Awards (see titles at bottom of post). Three were invited to join the Academy by multiple branches and they must choose one branch when joining (see asterisk in listing below). 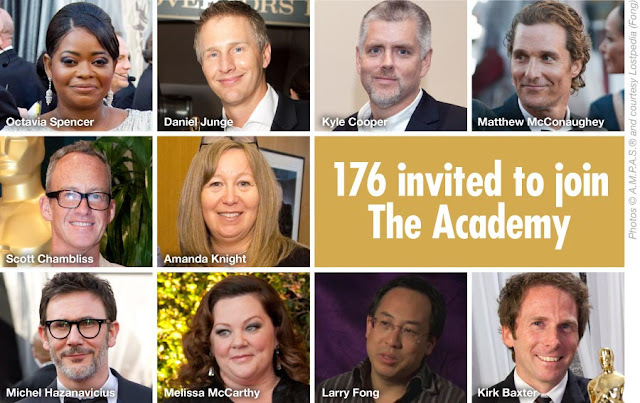 New members will be welcomed into the Academy at an invitation-only reception in September. 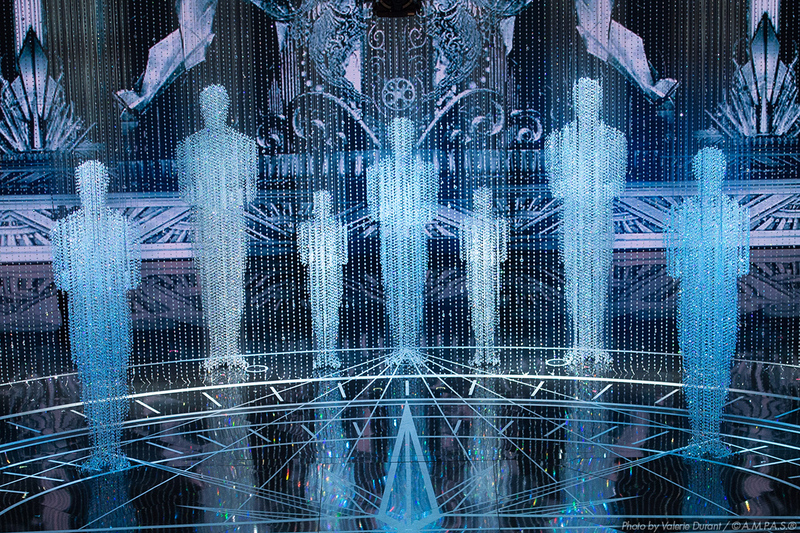 The Academy’s Board of Governors also approved a recommendation from the Art Directors Branch that will change the branch's name to the Designers Branch. The branch includes production designers, art directors, set decorators and costume designers. See all of the 2012 invitees after the jump. Wendy Aylsworth – Senior VP for technology, Warner Bros. Bud Davis – Stunt coordinator for "Forrest Gump," "Contact" and "Cast Away"
Chris deFaria – Executive producer for "Happy Feet Two" and "Sucker Punch"; production manager for "Where the Wild Things Are" and "Harry Potter and the Order of the Phoenix"
Sarah Katzman – Casting director for "The Change-Up" and "Horrible Bosses"
Heidi Levitt – Casting director for "The Artist"
Kerry Lyn McKissick – Script supervisor for "Thor" and "The Hangover"
Michael Tadross – Executive producer for "Sherlock Holmes" and "I Am Legend"
Mary Vernieu – Casting director for "Black Swan" and "The Wrestler"